Elegant, upscale interiors, with extraordinary ocean views from every room! This stunning, renovated townhouse is everything you have been searching for, and then some! Located in the world-class Kapalua® Resort, this Ridge villa offers sensational ocean and coastal views, plus the finest in island style luxury living accommodations. Situated on one of the most prized Maui locations, this elegant one bedroom, two bath villa is the perfect place to get away from it all. 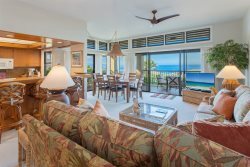 Its fabulous lanai offers guests sweeping views of the island of Molokai, of the sparkling blue Pacific and, the Kapalua® coastline. This inviting space is the perfect place to enjoy evening cocktails with friends and family, or to get in some whale watching during our winter months. The lanai features a table with seating to comfortably seat four. Inside your villa you will find that spectacular views are to be enjoyed from every window. The remodeled, spacious living room is just as comfortable as it is upscale. Designed to bring the outside in, the interiors of the villa are in perfect balance with the breathtaking vistas. Tiled flooring, cozy living space with pull-out sofa, coffee table, two chairs, flat screen TV and A/C provide guests with a space that’s perfect for entertaining or for a lazy evening reading a good book. Off the living room you will find an intimate dining room, and a table with seating for four. This dining room is accented by wrap-around windows, with ocean views that rival anything the finest restaurants in Maui have to offer. The remodeled kitchen is truly spectacular! Not only does the kitchen feature granite counter tops and top of the line amenities, but with the views it so aptly showcases, you will find it difficult to keep your eye on your cooking! Guests will find that the kitchen is fully stocked and ready to go. Everything you need to prepare and serve a meal is at your fingertips. During your stay, if you may find that you are in need of something extra, please don’t hesitate to ask and we’ll be more than happy to provide it for you! The kitchen is complete with a stove, freezer, refrigerator, microwave, a sink with disposal, all small appliances and a breakfast bar with two pull up chairs. On the first floor you will find a full bathroom. This remodeled guest bathroom features granite counter tops, a vanity, and sink and shower. This bathroom is wonderful for visiting guests, as well as adding extra room for everyone in your party to comfortably get ready for the day. Upstairs offers some of the most spectacular views at the villa, and, is where your master bedroom and bath are located. The master bedroom provides the equivalent of an oasis. With jaw-dropping ocean and coastal views, the wrap around windows provide a setting that can only be described as heavenly. This room also features tile flooring, a king size bed with ocean views, dresser and drawers, flat screen TV, AC and private lanai. Your private lanai is the perfect space to enjoy a hot cup of Kona Coffee in the morning and watch as the sun rises over the West Maui Mountains. From here you can see the island of Molokai’, then all the way down the coastline to the world famous Honolua Bay. The master bathroom provides guests with a tranquil space that rivals even the finest of spas; with granite counter tops and twin vanities with sinks; with tile flooring, an oversized soaking tub, a walk-in shower, and, washer and dryer, this bathroom has everything you need to relax and melt into your dream vacation! At the end of your day, perhaps after rinsing off the beach sand, there is no better feeling than sliding into a warm bath! Toss in some plumeria blossoms. Then let the exotic ambiance that is Maui embrace you. This villa comes with reserved covered parking, free wireless password protected high speed internet, digital cable, discounted golf, starter supply of paper towels, soap/shampoos, laundry detergent and bath/beach towels, beach chairs and cooler. We are the only licensed on-site property managers. We are also Ridge owners. Thus we take an extra bit of pride in what we do. Our aim is to see that your stay with us is absolutely beyond compare. Our rates are all inclusive. There are no surprises upon check-out! Late departures must be made at the time of booking for a fee of half a days rent. The Ridge features two beautiful, heated swimming pools. Both pool areas feature gas grills, lounge chairs, a location for eating, with tables and chairs, a shower, a soda machine and restrooms. Pool “One” has an additional full kitchen and large covered gathering area, making this a perfect space for large parties and entertaining. If fresh herbs may be just what you are after, these can be found surrounding each pool. There are many reasons why visitors choose The Ridge as their vacation destination. One of these is that Kapalua® Resort is a “low impact” resort; thus, guests staying at The Ridge find that they have the luxury of near endless activities available to them, but, without the large crowds, the traffic and noise. The Kapalua® Resort features three of the top State of Hawaii beaches, and these you will find just a short walk from your villa. 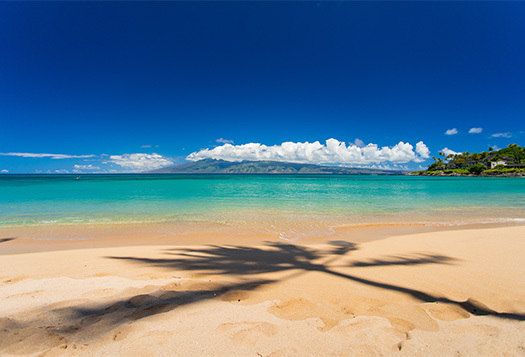 One of these beaches, Kapalua Bay, has won numerous awards for excellence, including “Best Beach in the US,” by Conde Nast. This bay is situated so that it is protected from heavy seas and wind. Its waters are calm and inviting; thus, it may be no surprise that Kapalua Bay offers some of the best snorkeling to be found on the island. Gentle waves, soft white sand and breathtaking beauty combine to secure a spot for this beach in top world rankings every year. Guests can also enjoy two golf courses – the PGA’s Plantation Course and The Bay Course. Both courses offer spectacular views of the Pacific and the island, while at the same time challenging even the best of golfers. In addition, visitors will find bike riding and hiking trails, tennis gardens, twelve world class restaurants, a fitness center, and two award winning spas – The Spa Montage and The Ritz Carlton Spa – all a short walk away. As a bonus, there is a free shuttle available. The driver will pick you up at your door and deliver you anywhere you care to go on the Resort grounds. Give them a call! This place is as advertised. Beautiful view And great location. The unit was clean and the staff was excellent to work with, fast response. I don't have many interactions or communications, which is perfect. If I can have all the information I need and just relax, I am happy. Luckily, the host's helpful notes made things much simpler. I certainly don't want to make many calls to get things done. Perfect location with a perfect host. Exceeded my expectations, to be exact. Each time we come here it is a real pleasure working with your team members. It is one of the main reasons we choose to stay at a Ridge Realty Rental. 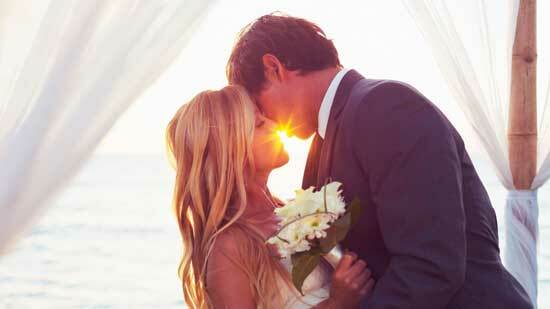 Each time we stay at your property our entire experience has been outstanding. That is the kind of consistency we love and causes us to look forward to our next stay with you! Our 25th visit to Kapalua. Nice unit for two, view and quietness.